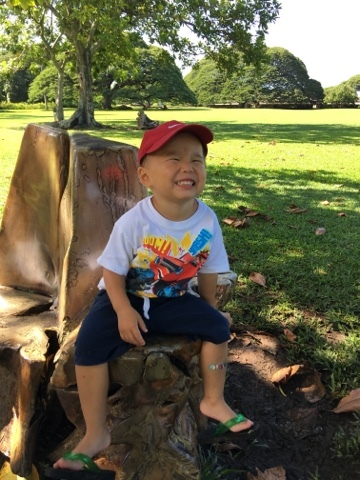 Since the weather was absolutely gorgeous this past weekend, we headed to Moanalua Gardens to have some fun outdoors. 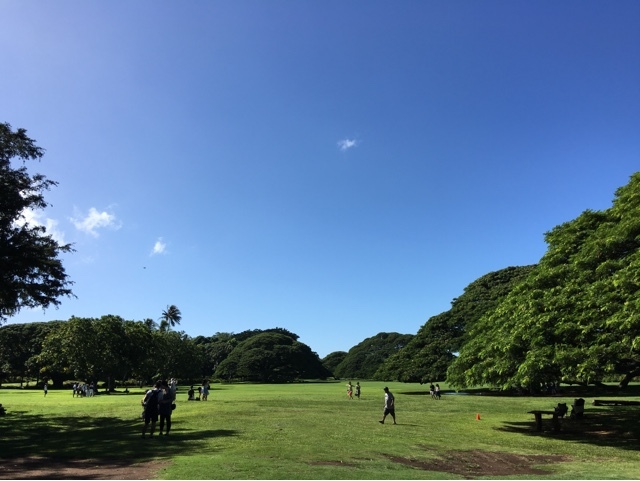 Moanalua Gardens is privately-owned, and up until 2015 admission is free. But now it's $3 for adults; $1 for Kama'aina and Military, and free for children 12 and under. The main reason we came here was to feed the ducks and fish. Can you imagine the thoughts that crossed our minds when we saw this at the entrance to the gift shop?? 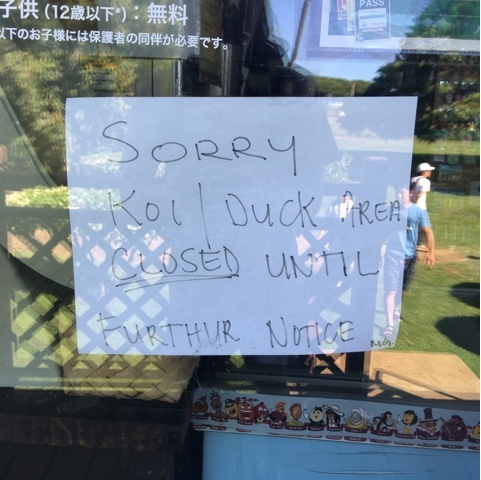 We proceeded to go in anyway, and as we paid our entrance fee, I asked the cashier why the koi area was closed. He said it's because they hadn't cleaned out the pond as of late, so the water was dirty and they did not want anyone to fall into the dirty water. But, he also said that the area was still accessible and that we could buy the koi pellets from him for $2 per cup. 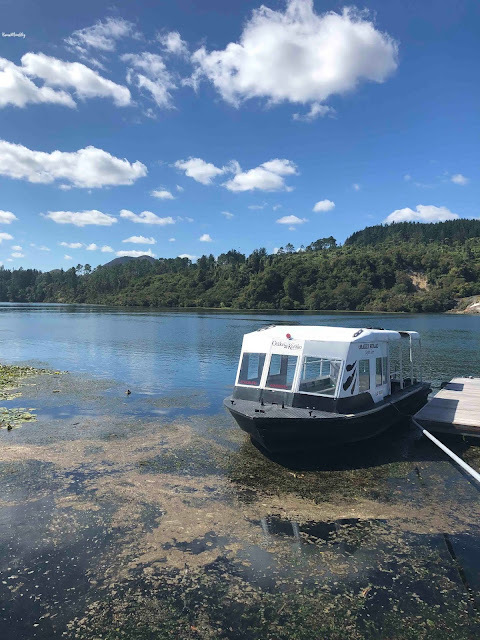 We didn't quite understand how the area could be closed yet we were still allowed to feed the fish, but we just shrugged our shoulders and bought a cup of food and headed towards the pond. 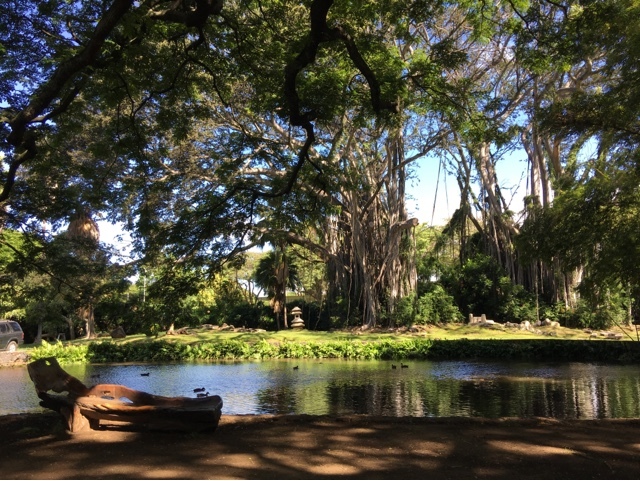 The Gardens is a popular spot for both tourists and locals. As you can see in the picture below, there is a lot of wide open space - ideal for letting the little ones run around to their heart's content. 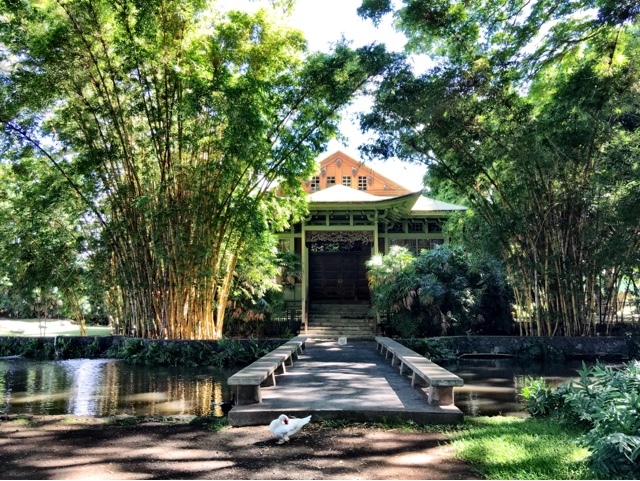 The koi pond is a short walk from the gift shop on the left. 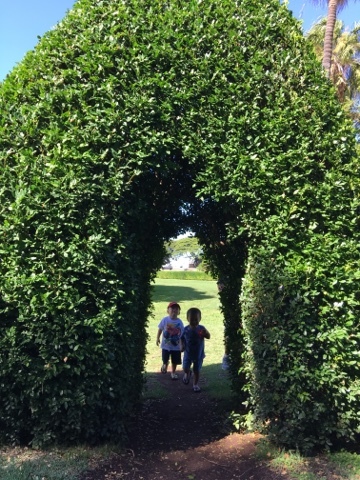 Thankfully there is a lot of shade in this area, because this is where we spent most of our time at the Gardens. As you can see, the pond is roped off, but you can still feed the fish. Only koi pellets are allowed (for the fish). 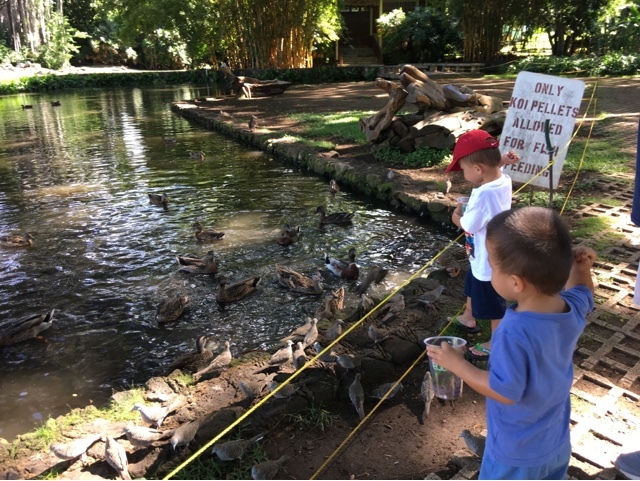 The boys had so much fun feeding the fish, ducks, and birds. We ended up buying three cups of pellets because they kept wanting to feed the fish. 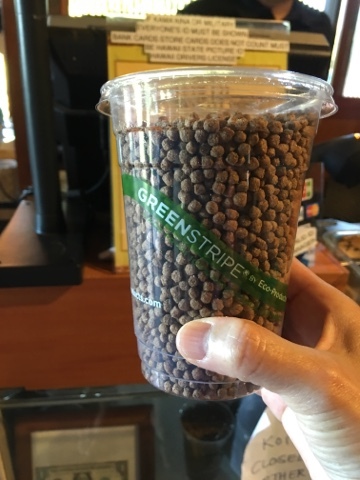 Next time we will bring our own pellets from the pet store. I think it's cheaper than buying it from the gift shop for $2 per cup. We will also bring our own bread to feed the birds and ducks. In addition to the koi pond, the park has a lot of other neat things to look at, including these chairs that are made out of old tree stumps. Just be sure to watch out for the ants that are crawling around in some of the crevices. And here is the reason why most people (especially the tourists from Japan) come here - to see the famous "Hitachi Tree". Hitachi, Ltd., (maker of electronics from Japan) has been using this tree as their corporate symbol since 1973. 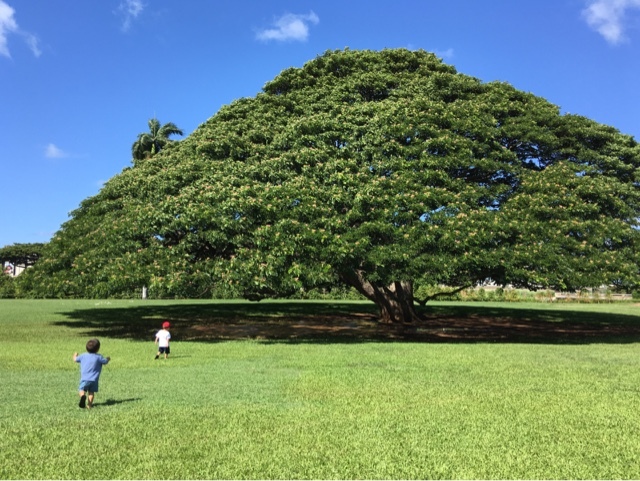 They are paying the current owners of Moanalua Gardens $400,000 per year to use this infamous Monkeypod tree in its advertising. Whoever thought a tree could be such a money-maker?! Whoever thought a tree could be a such a money-maker? 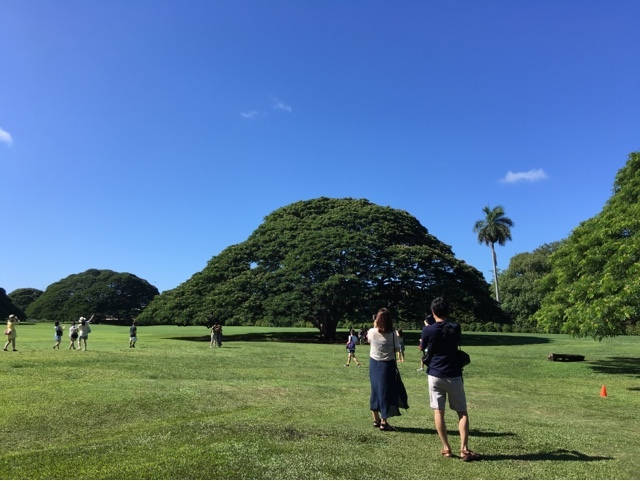 Because this tree (and a few others in the park) are considered "Exceptional Trees" by the C&C of Honolulu, it cannot be removed or destroyed without City Council approval. 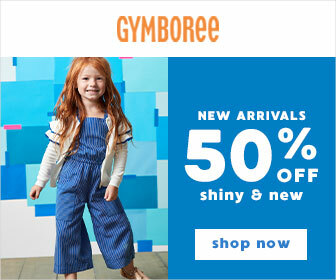 But since it's the corporate symbol for one of the largest makers of electronics in the world, I don't think the tree will be going anywhere soon.